The Reunion's biggest benefactor : Rik Sands reflects. This was another of my Promotions, but it does show that when in the ring our heads were only about 4ft from the ceiling so body slams or big hypes were definitely out. That's me with Steve Viedor, when I had some hair. At the time I was running 4 Judo Clubs, one of them at this Venue another at Thames Television, that lasted 9 years as well. Two other clubs, The Fairholme Judokan in Bedfont which is still going to this day and the England Judo Coach took over from me. Roy Inman who fought John Paul Koch, the World Champion to a 15 minute draw. Another club in Feltham Residents Association Club at Sparrow Farm, Feltham. 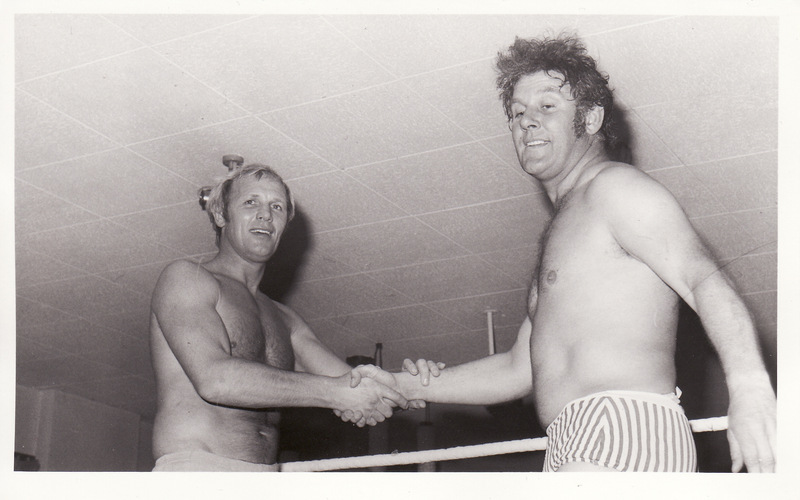 Back to the Wrestling ,at my other Club Feltham Ex Service mans Club Fetham, Johnny Kincaid and The Killer Kowalski were on the bill and went down a Storm. The Venue was sold out as one of Roy Parkes boys was on the bill and he alone sold 100 tickets, Roy came with his Wife Toby who downed 32 Cherry B's she told me as she was so excited. Back to my bout with Steve, he was amazing, his timing and ring-craft was so good I was memorized by his ability. There was me a 2nd Dan Black Belt and I felt like I was starting all over he was so enthralling. Everyone enjoyed it as it showed the two arts coming together and I was way out of my depth with Steve being so good. It really helped to understand ringcraft a lot better and then I was able to adapt a lot of my Judo skills into wrestling moves, a very big learning curve. The third picture is of Steve Viedor with our resident referee Benji Elliot who used to come to my Judo to learn to breakfall as he quite often was so involved with the bout that he got dumped a few times but was able to take it. The last picture is of a Promotion of mine at Feltham Assembly Rooms, Felthem, Middlesex. 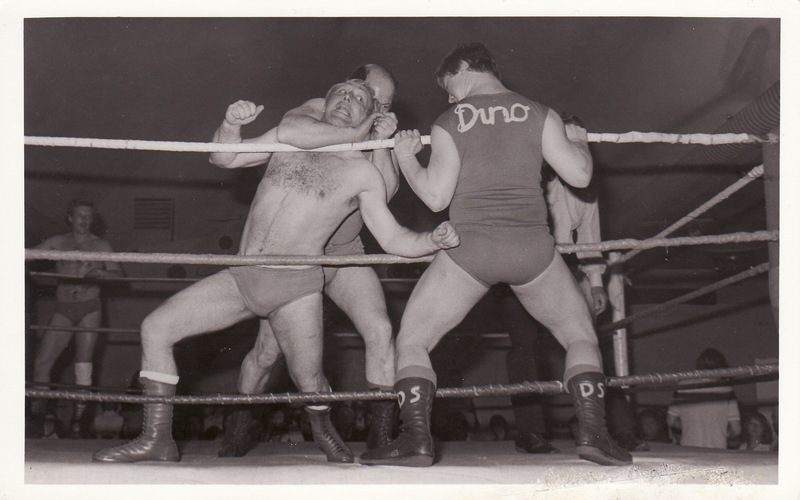 There you can see a Tag match with Dino Scarlo and his Dad against Bob Taylor and Paul Knight and it bought the house down. They were really good and got some terrific heat going there the audience loved it. One problem was that it was a charity do and the Mayor and his Lady were there and I was on with Jim Martell from Engelfield Green and during the bout he aimed me through the ropes and I ended up going over and getting ny neck caught between the middle and top rope. As I am hanging there and they are trying to get me out the Mayoress fainted and luckily had a St Johns Ambulance chap there on duty who managed to bring her round and sort it out, and the show went on after they left. The one good thing there was that my pal a Publican got the license to run the bar there and we made a nice few bob that way, including everyone getting paid. We raised a fair sum and it was later presented to the Mayor but I have lost the newspaper cutting of it. 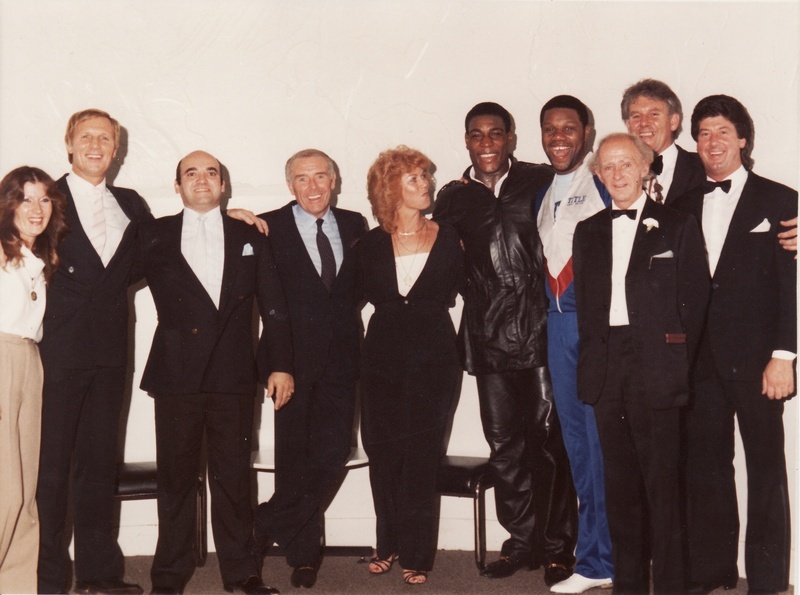 The strangest Charity Show we did was at Heston Catholic Club, with Clive Ironfist Myers as top of the bill. We had a guy who worked as the Executioner (Jim Green) with the thermos flask, he was 6ft 6in and would come in with Desdemona on his shoulder wearing a fur coat. When he lowered her into the ring she would take the coat of and had a Bikini on and would towel Jim down. He is on with one of Roy Parkes sons Stan, a big lad, of course Jim in the mask was giving Stan all kinds of hell for about three rounds. Towards the end of the third Stan Parke's Wife jumps up onto the Apron of the groin and whacks The Executioner over the head with a wooden Clog shoe she was wearing. That round finished and half way through the forth round and there is blood appearing from under Jim Green's mask, the Ref stopped the fight and Jim was taken to Hospital with a three inch gash in his head and they sewed it together with what looked to us like binder twine. From then on Stan was asked not to bring his Wife, who could have a row with the best of them. Jim Green ran a Pub in Hounslow for quite a few years called The Honeycomb, and he did lots more shows for me, he was registered in the Film agency Uglies as he had massive hairy hands. The ending of the Show at Heston was Clive Myers doing 40 knuckle press ups in the ring while waiting for his opponent. 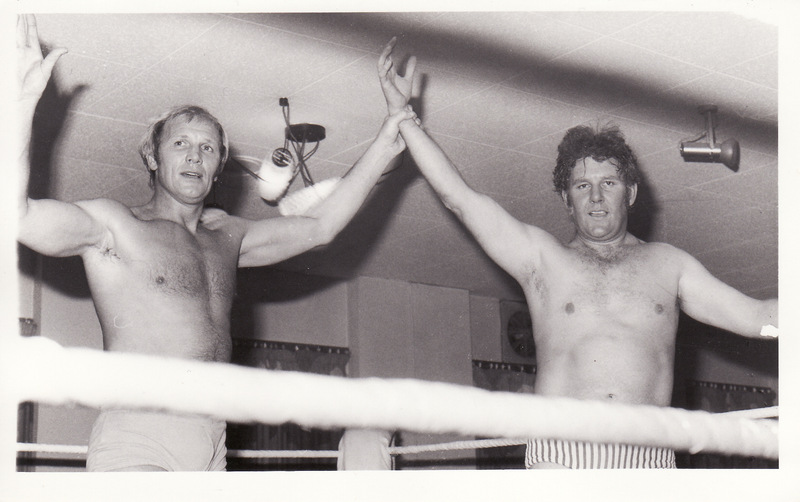 Then whilst I am introducing him a punter jumped into the ring and said, "I am a pal of Jackie Pallo and I'm going have you, I think he had been on the sauce all the evening and this was the final bout. Needless to say Clive dispatched the guy in seconds and we carried him out of the Club and dumped him outside and he was banned from ever going to the Club again. 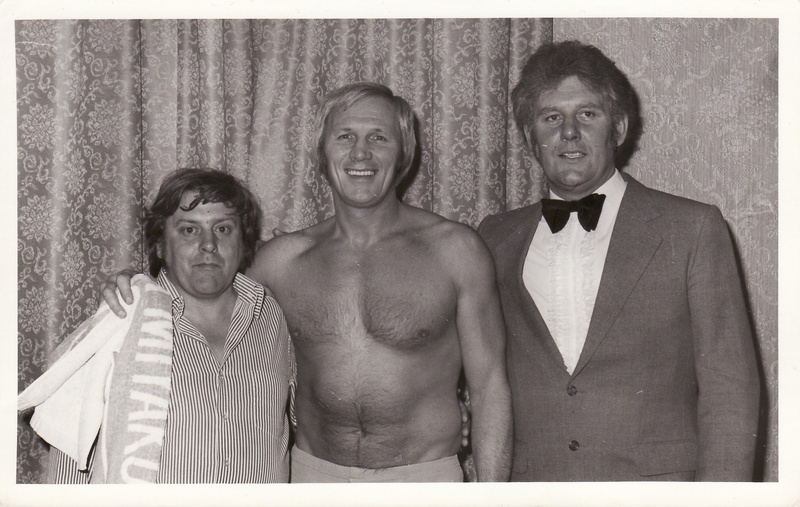 The first memory is of Bob Kirwood and Johnny Winters (Brighton) at one of my Promotions at Feltham Ex Servicemans Club, Steve Veidor, Kinkers ( Johnny Kincaid), and Killer Kowalski were also on the bill, plus Roy Parkes and me. Roy (Mr Big) Parkes decided I was in his way I think, he picked me up in one hand on my Judo Belt and dropped me over the top rope. My Mother in Law threatend Roy with the wrath of Hell but we carried on the bout. Roy splashed me in the fourth round and I wasnt going anywhere under 21 stone. We packed the place out and the bar took £20 short of their best ever Christmas takings. 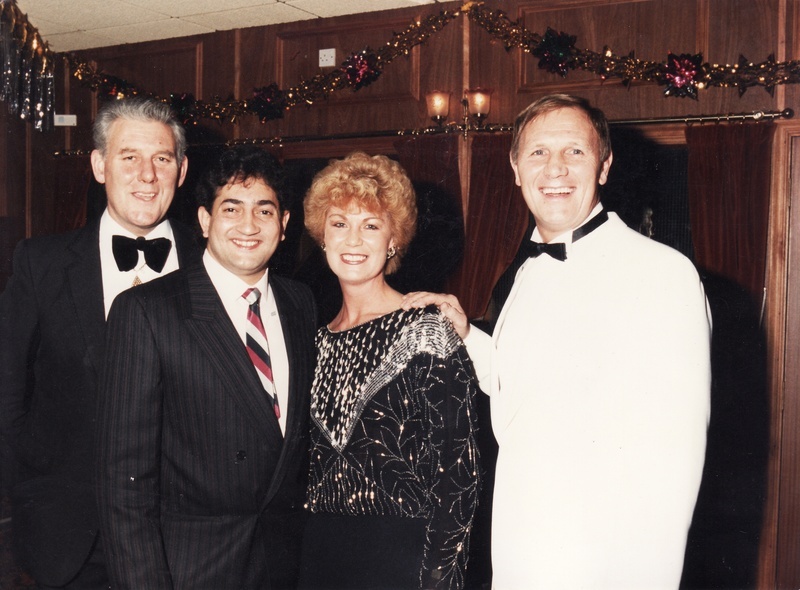 The second memory is of Steve Veidor, his lovely Wife Jenny and myself at a do with Joe Johnson, theWorld Snooker Champion at the Grosvenor Hotel for Charity. The third memory today, is of Frank Bruno, Terry Lawless ( Franks Manager) Adrian Elliot (Amateur Super Heavyweight Boxer) Steve Veidor, Jenny his Wife, Danny Head Doorman at The Hippodrome, and myself. We put on an Exhibition bout of Boxing with Frank and Adrian, for the Showbiz Charity with Peter Stringfellow. The ring was in the middle of the Hippodrome and 2500 people turned up, Gary Mason another Lawless Boxer was also there. I was only supposed to be the M.C. but Harry Gibb was not allowed to referee a Exhibition bout when he was refereeing Bruno fighting within a months time. Guess what Stringfellow jumped in the ring and said," I want to introduce you to Britains Great White hope". Then realized and said, "I hand over to Ricky Sands", I then did the proper announcement about the Charity , then had to take off my Jacket and Referee the bout. We raised a lot of money and it was presented to The King Rat of the Water Rats. When it was all over, Stringfellow then went and made us all, smoked salmon and scrambled egg with Champagne for Breakfast. A very good night was had by all. Final memory for today,was when I put on a team event in the home for Servicemen injured in various wars, based at Richmond Hill, Richmond. 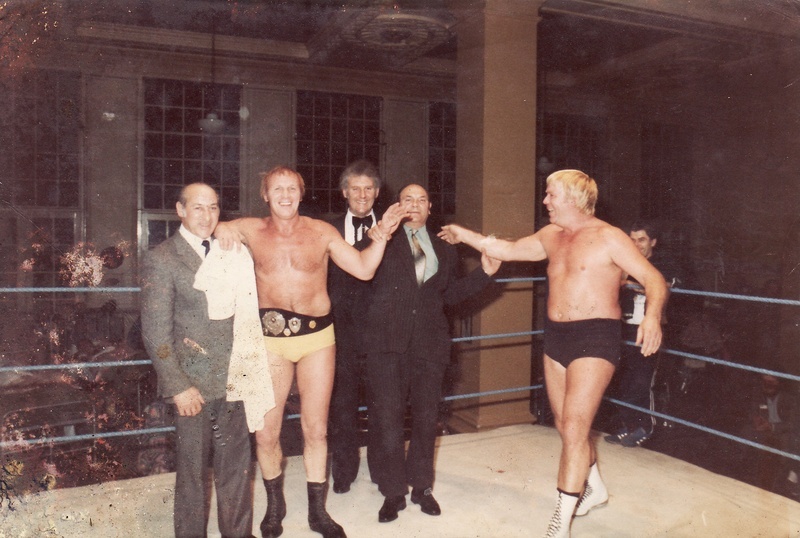 This I was told was the first and only time that Wrestling had ever entered the hallowed halls of this magnificent building near the Thames, in 125 years. This vast palatial edifice of a Historical Building was about to be invaded by two teams of, as Major Harris the Director of the place said, "Strangely named chaps in swimming costumes" This was a direct reference to John 'The Killer' Kowalski and Tarzan Jon Wilson and others. My reply was that these so called chaps were giving their time up for nothing to raise money for his Charity. He then said "We had The London Philharmonic Orchestra here last week and lost £400, I replied with the pre sold tickets we are already £200 in front so no worries. On the night the whole of one side of this massive Baronial Hall was filled with patients in wheelchairs and even in beds. The other side was all the punters, my car dealer pals, and loads from different pubs in the area. Plenty from The Ferry Boat Inn that Steve Veidor owned and I was on the door, packed out.